If you are planning to set up your own home recording studio, the main thing you have to consider is a studio microphone. 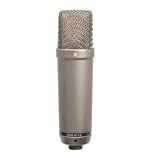 If you search online for studio microphone recommendations, you will be given thousands upon thousands of choices. That’s how saturated the market for microphones is at this point in time. To help you cut through the crap and find the perfect mic for your studios setup, here are our picks for the top 3 studio microphones of 2017. While not the cheapest options out there, the MXL 770 is, in my opinion, the absolute best bang for your buck when it comes to a quality studio mic. If you’re familiar with the studio recording industry, you’ll know that Nuemann mics are often considered the gold standard of recording performance – I can honestly say that this MXL condenser mic is absolutely just as good as some of the much more expensive Nuemann models I’ve had in the past. It’s actually shocking how great this mic is for its price. The best thing about this mic is how versatile it is. Rap vocals, female vocals, voice overs, instrument recordings of all kinds…you can throw anything in the world at the MXL 770 and the result will be pure audio bliss. On the technical side, this condenser mic features a 22mm diaphragm, a 30 Hz – 20 kHz frequency response range, a max SPL of 137db, and an output impedance of 150 Ohms. It comes with a (mediocre) shock stand as well as a “rugged” carrying case. If you don’t know where to start with studio mics, or are just looking to upgrade a super cheap model you’ve grown out of, look no further than the MXL 770. Audio-Technica offers a wide range of audio products, and are especially well known for their studio-grade headphones. The AT2035 condenser mic holds up their high fidelity reputation and then some, serving as a perfect “general use” recording microphone. Out of the box, you can expect a .96″ diaphragm, 20 Hz – 20 KHz frequency range, -33dB sensitivty, and a stellar signal-to-noise ration of 82dB (at 1kHz at 1 Pa). Simply put, this thing punches well above its weight and easily competes with microphones that cost 10x as much. It’s well-suited for vocals of just about any type, bringing warmth and life to even the most minute audio subtleties during the recording process. AT includes a quality pop filter, 10 foot XLR cable, and a bonus microfiber cleaning cloth to boot, along with your standard shock mount. If you’re looking for a good “beginner” mic that you’ll honestly never have to upgrade, the AT2035 is a perfect choice. It’s hard to research studio microphones without coming across Rode’s NT1A model mentioned, often numerous times. Truth be told, it’s hard to find a single negative review of this awesome mic at all. The NT1A is considered by many to be the “best” entry-level “true” studio quality mic out there, and it serves vocals o f all types extremely well. While you’ll be especially blown away by it’s crystal clear middle and high frequencies, it’s no slouch on the low frequency end either. The NT1A is the anniversary edition of the original NT1, which just goes to show how in-demand this Rode model is and has been for so long. If you’re investing in your first high quality studio mic, I guarantee the NT1A will last you for years and years to come. It’s so good that there’s simply nothing to “upgrade,” until you start getting into truly expensive territory. For a high quality beginner setup, you can’t go wrong with the Rode NT1A. When making your selection of studio microphones, there are a few things to consider – the type of instrument or voice you are going to record, the brand you want to go with, and so on. With thousands to choose from, the task of making the right choice will seem like a daunting one, especially if you’re a newcomer to the recording business scene. Studio microphones could be categorized under 2 general “umbrella” classifications. These two classes are Condenser Microphones and Dynamic Microphones. The majority of the mics you will ever use in a studio will fall into one of the two major categories mentioned above, in fact- close to 95% of mics are one or the other. Once you become familiar with each type of microphone, it’s easier to narrow down your selection. The rule of thumb when it comes to frequency response is this: Condenser mics are better for high-frequency uses such as acoustic guitars, cymbals and pianos. Dynamic mics, on the other hand, are more apt for drums and electric guitar cabs. While this is not definitive as a rule, it is a good starting point when making the choice between different mics. The reason why condenser mics work better with high frequencies is because of the smaller diaphragm size to capture sound – smaller diaphragms are more receptive of such sound frequencies. Bigger and heavier diaphragms are less receptive to high frequency sounds and therefore not quite as practical for such applications. High frequencies contain less energy and thus needs less power to move such mass. On the flip side, heavier diaphragms’ larger mass generates enough voltage through movement, which eliminates the need for external power source to power the mic. This is the reason why Dynamic Mics are also called “passive”. On the other hand, Condenser Mics are “active” in nature as they require phantom power to amplify the lower voltage. Although it may sound like a negative aspect, it is actually a needed quality as active Condenser mics can achieve a higher gain and record softer sounds, which passive mics find difficult to do. While lighter diaphragms are ideal for capturing high frequency sounds, they tend to be less durable than heavier diaphragms. At higher Sound Pressure Levels (SPL), they could be damaged permanently. This is the reason why heavy diaphragm mics are perfect for louder instruments like drums. Dynamic mics do not only have a more durable diaphragm, but also more curable overall construction. Even if you drop the mic on the ground, it will work just fine afterwards. Drop a Condenser mic, and you might as well start looking for a replacement mic. This makes dynamic mics perfect for on stage performances like concerts. Another reason dynamic mics are great for on-stage use is its high resistance to moisture, sudden changes in climate like humidity. On the other hand, condenser mics are more prone to malfunction when exposed to extreme humidity. This is another reason dynamic mics are more suitable than condenser mics on stage-they allow higher gain before any feedback is noticeable. In live settings like concerts where many mics are in use, many sounds in close proximity to each other will tend to produce feedback. Dynamic Mics are generally cheaper than Condenser Mics, as you can get the most expensive dynamic mic at a price range of $400 to $500 max. In comparison, the top of the line Condenser mics could go as high as $5000 to $10,000 each. Quite a big investment, but well worth every dollar. Just because Condenser Mics are pricier does not make them the “better” choice for your home studio. Some beginners think that the cost of the mics are indication of its performance. And from what we have gone through so far, it’s not hard to see why. But the truth of the matter is- neither mic is better than the other. Each type is good for a certain purpose, and that makes both types important to a recording studio. 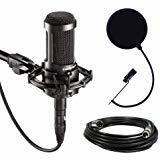 A good recording studio has multiple mics, each used to record certain types of sound or instruments. Large-Diaphragm Condenser Mics – This is the standard microphone used for recording voice, and you usually spot it being used in movies, as they exude dramatic style and effect. It also records instrument sounds quite beautifully. It is usually the first microphone used in most studios. Small-Diaphragm Condenser Mics – These are more familiarly called “pencil mics” because of the thin shape and form and are perfect for recording musical instruments in rich, high frequency tones such as acoustic guitars and cymbals. A pair of small-diaphragm condenser mics is perfect for singing while playing along with an acoustic guitar. Dynamic “Utility” Mics – These are general purpose mics which does the job well, and are perfect for electric guitars, drums and rock vocals. These mics work well for a rock band recording session. Most decent studios usually have dozens of these on hand. Bass Mics – Most dynamic mics could be used as bass microphone, but using a dedicated bass mic will capture even the lowest frequency sounds from bass instruments. This mic is commonly used for bass guitars or kick drums, and they are known by a low end boost, a small scoop in the mids, and a presence of boost at 4K. These mics work well with bass cabinets and most studios have at least one of these around. Multi-Pattern Mics – These are usually found in large diaphragm mic formats and features a unique dual-capsule design, which allows you to switch to different the 3 common patterns, namely: Cardioid, Omni-Directional, and Figure 8. It’s a very versatile tool used for stereo recording, although not a necessity for beginners. It would benefit a beginner to familiarize themselves with such advance tools sooner. Ribbon Mics – This type of mic is quite unique because it is neither a dynamic nor a condenser mic and therefore belongs to its own unique category. It uses a thin aluminum “ribbon” diaphragm to capture sound. Some features of the ribbon mic are: durability comparable to dynamic mics, high frequency sensitivity comparable to condenser mics, and a standard figure-8 polar pattern. Professionals praise such mics for their versatility and quality, but the high price range makes it impractical for beginners. USB Mics – These types of mics don’t belong to a professional recording studio, so you won’t see a lot of them there. They didn’t even begin to exist until around 2005 where bedroom studios and podcasting became very popular. It’s a no-fuss solution as you only need a USB port to use one, no need for pre-amps and specialized interfaces. It’s as easy as plug and play, these could even work on some tablets with USB ports. Boundary Mics – These are rarely used in home studios, in fact some studio owners may never have heard of them, but boundary mics or PZM Mics are essential recording tools. Unlike most common mics, these don’t go on a stand, but rather mounted to a wall, or on top of a table or any flat stable surface. Other mics are prone to comb filtering where direct and reflected sound combine out-of-phase, boundary mics are immune to this effect as the speaker is perfectly aligned to the wall. These could be used in conference rooms and theaters as well as in studio. Shotgun Mics – These are rarely used in studios, but the most common use of the shotgun mic is in the TV Newsroom and for wildlife documentaries for their unique capability to isolate sounds. By using this mic you can record farther from the source and even in a noisy environment such as a street full of people and cars, and you will do just fine. Setting up a home recording studio can be a nerve-racking task for a total newbie. This guide, and many like it available on the internet, will help you make a smoother transition into the recording studio business. We hope to inspire confidence in you as you embark on this wonderful journey, and that you have a great experience like we did when we first forayed into the home studio arena. It is always comforting to know others have taken this path before!